Madman has announced that it will be releasing Shinkai Makoto’s box office smash hit Your Name in Australian and New Zealand cinemas before the end of the year. Since its release in Japanese cinemas on August 26, Your Name has been unstoppable at the local box office, having stayed at the top of the charts for nine consecutive weekends so far. As of October 24, the film has grossed 16.41 billion yen (approximately US$158 million). 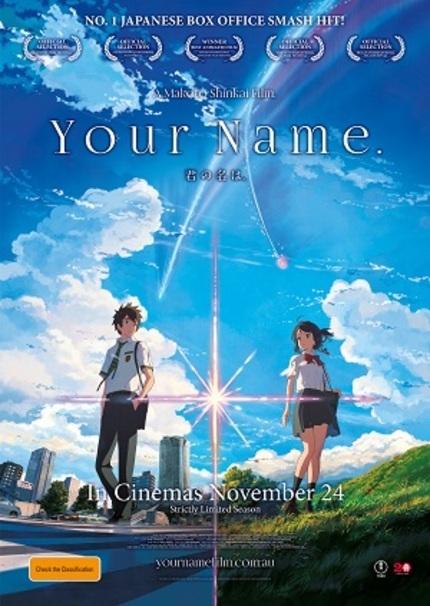 It surpassed Miyazaki Hayao’s The Wind Rises and Ponyo and is currently the fourth highest grossing anime film in Japan, behind Miyazaki’s Princess Mononoke, Howl’s Moving Castle and Spirited Away. Analysts are predicting that it will reach 20 billion yen (approximately US$190 million) in Japan and if that happens, it will overtake Princess Mononoke and Howl’s Moving Castle to become Japan’s second highest grossing anime film of all time (behind only Spirited Away). The good news for anime fans living in Australia and New Zealand is that Madman is bringing Your Name to Australian cinemas on November 24 and New Zealand cinemas on December 1. Check out the official website for details.